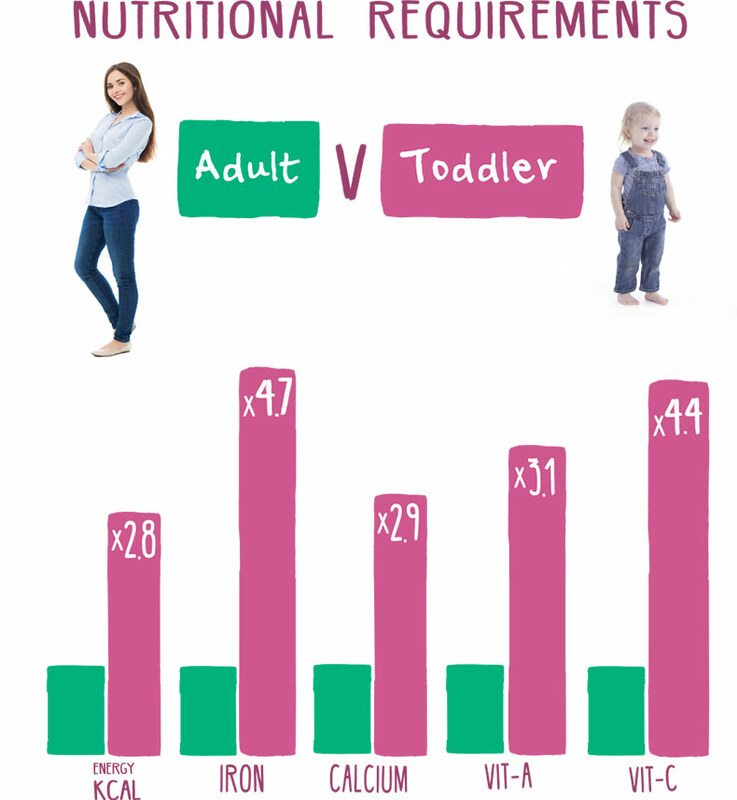 Between the ages of 1 and 3 years a toddler gains an amazing 40% in height and weight. A healthy diet is important during this time to support your little one’s growing body and brain. Your toddler also needs nearly 4 times the amount of iron, nearly 3 times more zinc and 5 times the amount of calcium and Vitamin D (per kg of their body weight), compared to an adult. A toddlers’ stomach is the same size as their closed fist so therefore each spoonful of food is important. In order to achieve your toddler’s high nutrient needs you should aim to give three balanced toddler -sized meals and 2-3 healthy snacks per day. Providing a balanced diet for your toddler involves combining foods from five different food groups and serving them in the correct proportions. 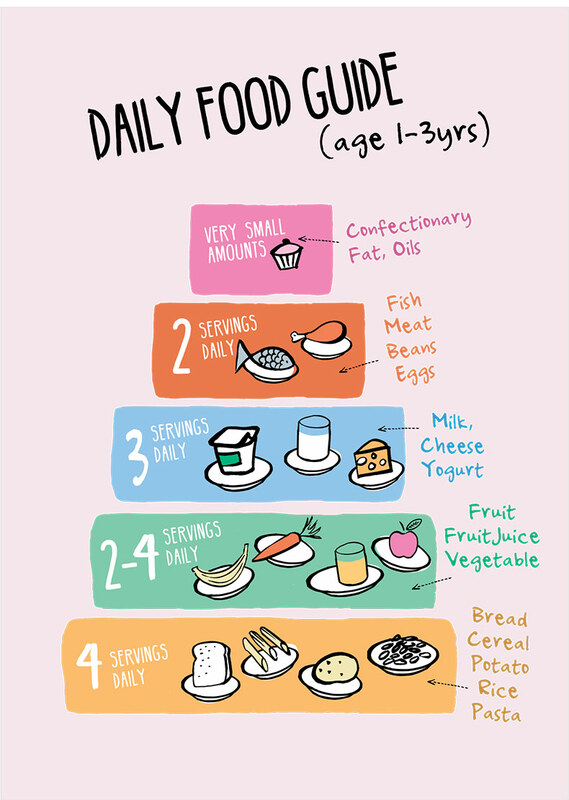 The toddler food pyramid below can be used as a guide to help you! This food group includes all types of bread, pasta, rice, couscous, potatoes, sweet potatoes and breakfast cereals. A mixture of some white and some wholegrain varieties of bread and cereals should be offered. Active toddlers may need more servings from this food group to give them enough energy. This food group includes fresh, frozen or tinned fruit (without syrup) and vegetables. This food group includes dairy foods such as *milk, cheese and yogurt, which are rich in protein, calcium and some vitamins and minerals. Butter and cream are not included because they have virtually no protein and little calcium. * Low fat milk is not suitable as the main drink for toddlers under 2 years of age. You can gradually introduce it after 2 years of age provided your toddler is eating a varied diet. Meat, Fish & Vegetarian Alternatives – Provide protein for normal growth and development. This food group includes all red meat, chicken, *fish, eggs, nuts and pulses i.e. starchy beans like kidney beans, baked beans, butterbeans, chickpeas, lentils and dhal. *Processed meats like chicken nuggets, sausages, fish fingers and burgers tend to be lower in protein and often high in fat. Try not to offer your toddler these foods on a regular basis. This food group sits on the top shelf of the pyramid and includes butter, oils, margarine, cakes, biscuits, ice cream, sweets, crisps, fizzy drinks and fruit juices. These foods should not be a part of your toddler’s daily diet. Filling up on foods from this shelf spoils your toddler’s appetite for more nutritious food. Remember your toddler’s stomach is small i.e. same size as their closed fist, so every spoonful counts. Sugary food and drinks will also affect your toddler’s teeth.